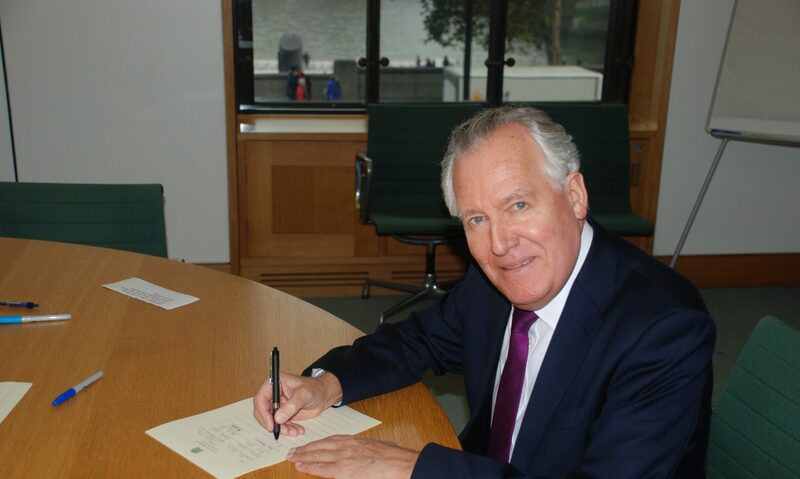 Peter Hain MP for Neath: I have a soft sport for the Honourable Lady (Cheryl Gillan) but I must say that her speech symbolises the abject failure of opposition parties to propose any serious policy at all, alternative to the Chancellor’s PBR. The Conservatives with their plans for huge cuts would plunge Wales back into the misery of the Thatcher years. And they have absolutely nothing consistent or coherent to say about solutions to the global financial turmoil and voters have rumbled them as this mornings Guardian poll shows. The same is true of the Liberal Democrats with their £20bn cuts plan. And frankly Plaid Cymru’s policies are quite frankly a joke – taking as their model Iceland – a sort of policy for an ‘ice-age’ Wales – combined with independence which would leave Wales a whopping £9 billion a year worse off, more than half the Welsh Annual budget and bankrupt. Can I however suggest how we might build on the PBR in respect of the endemic unwillingness of the financial institutions to provide loans. The Financial Times reported on December 8 2008 that the Chancellor is considering an extension of taxpayer guarantees to cover business lending, because the economy is still starved of credit in spite of the £50bn recapitalisation of the banks. The most radical Treasury option under study is apparently for the taxpayer to reopen the wholesale markets to banks by offering guarantees to securities backed by new lending. The FT reported that such a guarantee should cover lending generally, and securities backed by small business loans, car loans or other lending might be included. I have been talking to my constituent Peter Morgan who has had 35 years of experience as an estate agent in Neath, with other offices along the M4 corridor. He tells me that the problem for the sector can be brought down to just one factor: the total lack of availability of higher percentage mortgages (90% to 95%). There is no need for the reckless 100% or higher mortgages of previous times, he maintains and I agree with him. But he says that lenders, in an effort to increase their liquidity, are using the media’s reports that prices are still falling, and will continue to fall, as an excuse to decline to lend. So my proposal is for the Government to offer a form of guarantee on the higher percentage mortgages, so that if the borrower defaulted and the property were to be repossessed, the Government would repay the difference. This would mean that the lenders would have no further reason or excuse not to lend. Which would have an immediate effect on the property market. Peter Morgan tells me that he and other estate agents have more willing sellers at the moment than at any time in his experience. At any time. Despite the lack of security in employment they also have plenty of buyers wishing to purchase, but who are unable to do so due the lack of availability of mortgage funds. So it’s not a problem of housing supply or demand it’s a problem of finance. If the market were to be ‘kick-started’ then he feels confident that prices would no longer fall. This would result in positive publicity and hopefully stop the downward spiral. We as we all know are a nation which relies on the value of our housing stock to provide security, confidence and in a lot of cases the facility to secure future borrowing and credit. It would be my suggestion that the Government could indemnify the lender against any loss on the mortgage advance for say a period of 2 years in the event that the property is re-possessed. This should be sufficient to guarantee that the lenders have no reason not to provide the 90-95% mortgages at a favourable rate which are desperately needed. Due to the considerable drop in prices over the past 18 months around 20 – 25% and the reduction in interest rates, properties are now very affordable to first time purchasers in a way that they weren’t. The only reason that they are unable to buy is the lack of high percentage mortgage availablity. This also applies to the buy-to-let market. This will boost opportunities for first time buyers, and galvanise the whole housing market because it is their inability to get home loans which has log-jammed everything. Could the Secretary of State please raise this proposal with the Chancellor as soon as possible and let me know the outcome? Then there is the vital issue of lack of finance for businesses. If the Chancellor’s thinking around loan guarantees is pursued it is in line what many businesses have convinced me could make a real difference. The banks currently look at the overall situation and see commercial risk in all directions. When they look at, for example car manufacturing, they consider a car sales situation for a particular company, currently massively down on last year, and the precarious nature of some of dealer network. The failure of a dealer would put extra stock into the market, undermining residual values and create a knock- on effect. The banks then look at the supplier network and see the potential problems that a collapse of General Motors or Chrysler might have on this. The failure of a supplier could potentially stop production lines and have a significant effect on output. It is then possible to understand why the banks are reluctant to be flexible on their policies and bank covenants. They are just taking a normal prudent banking point of view albeit a frustratingly self interested one. On the other hand the Government is the only party that can take a global view on the situation as it influences all aspects of the economy and to intervene as we have led the way in doing over the past month. I think the only way we will therefore unlock funding from the banks is by way of Government guarantees for approved facilities to industries that are profitable but have short term financing issues. One would naturally expect this to be coupled with certain restrictions such that whilst the Government guarantee was in place there would be limitations on the distribution of funds from the company, and that sort of thing. Again I would be grateful if my Right Honourable Friend would raise this made-in-Wales proposal with the Chancellor and let me know the outcome? Could he also discuss with First Minister the Local Government Settlement. Which seems to be in Wales unchanged by the Pre Budget Report. In England it was over 4%, Wales just 2.9% Yet the Assembly budget has been increased in 2009/10 by 4.2%. Despite the fact that services provided by Local Government touch every child, people of working age, the elderly and those with disabilities, it is not getting an equitable share of the budget. I applaud the Finance Minister Andrew Davies’ tough decision and his confronting a lot of difficult choices that the Assembly Government has not made over the past years. How on earth does the Assembly prioritise investment in these critical services much lower than increases in their centrally controlled budgets including central services and admin? The latter will have a £25m increase, more than double inflation and more than treble local government. Neath Port Talbot’s increase at 2% means a significant real terms cut of over 2 per cent. So efficiency savings of 1.73% are required just to meet inflationary pressures. Children’s social services – The Baby ‘P’ case being a particular issue to be addressed. All in all, with the County Council will be about £8m short – meaning either massive cuts or the very big council tax hike its Labour leadership has pledged not to do. Yet Neath Port Talbot is universally acknowledged to be the most efficient County Council in Wales delivering the best quality services from education to planning, and has already made huge efficiency savings, much greater than many other County Councils with a relatively deprived population nevertheless. Neath Port Talbot also has a £20 million liability from the Icelandic banks. Could he please press the Chancellor or relevant Minister of State to grant local government a much more sympathetic ear than they appear to have had on this problem? Notwithstanding these issues that I have raised, can I support the Government’s policies which show that only Labour can lead Wales successfully out of the global crisis.